Featuring a thoughtfully refined design that allows users to do so much more using the built-in S Pen, Samsung’s new Notebook 9 Pen was built for those who are always exploring, always creating, and never content to simply stand still. The 2-in-1 PC’s cutting-edge specs, including a powerful 8th Generation Intel® Core™ i7 processor, and exceptional portability make it incredibly versatile, and perfect for those who are always on the move. Let’s explore how Samsung optimized the premium device to feature some truly amazing moves of its own. 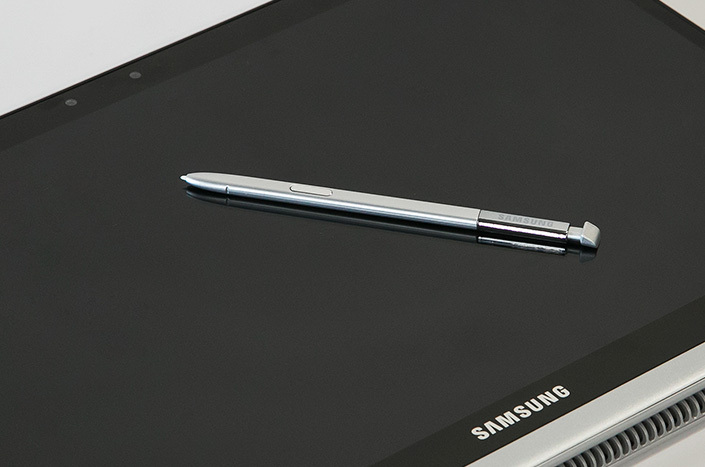 The Notebook 9 Pen’s slim, single-shell body is as seamless and refined as ever, and now even more portable thanks to Samsung’s use of Metal12™. This ultralight magnesium-aluminum alloy allows the notebook to weigh in at just 995 grams (2.2 pounds), which makes it one of the lightest in its class. In addition, the alloy itself has been treated with an advanced Micro Arc Oxidation (MAO) process that provides its surface with a tough oxide coating, enhancing durability. The S Pen seamlessly slots into the bottom of the notebook, so it’s always there when you need it. 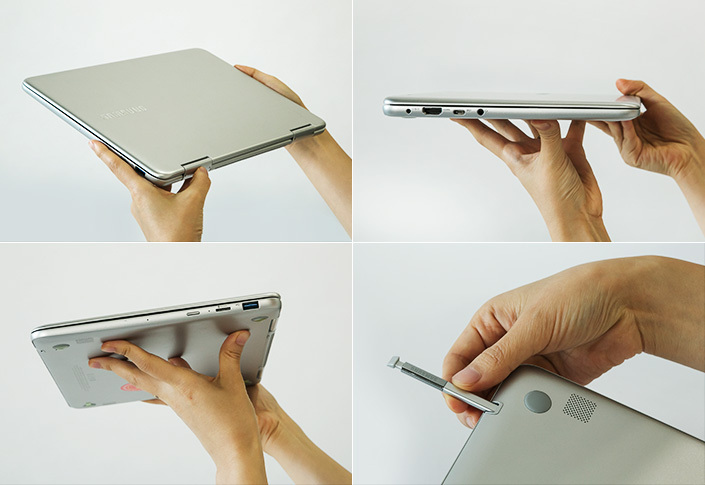 And when inspiration strikes, the 360-degree convertible hinge lets you instantly transform the device from a notebook into a tablet, allowing you to comfortably access the vibrant, 13-inch RealView display from any angle. Content depicted on the premium display is bright and accurate, thanks to the device’s peak brightness of 450 nits and ability to display 95 percent of the sRGB color space. This allows the notebook to produce lifelike colors and picture quality, which makes it a perfect fit for graphic designers, and makes everything from viewing a video to reading or browsing the web more immersive and engaging. The display also features a wide, 178-degree viewing angle that allows it to be seen clearly when users adjust their position, or when they are viewing or collaborating on content with friends or colleagues. Because the Notebook 9 Pen was designed for mobility, it also supports a variety of convenient charging methods that make it easy for users to power up on the go – even without the device’s compact adaptor. The notebook may be easily charged via a compatible smartphone charger or an external battery pack, and even supports fast charging. * So you won’t have to worry about a misplaced adaptor impeding your productivity. The Notebook 9 Pen’s S Pen is impeccably precise, featuring a 0.7mm tip and capable of recognizing up to 4,096 levels of pressure. This level of precision, along with the implement’s ability to detect when it’s been tilted, evokes an incredibly natural writing experience and allows artists to express fine details with ease. The notebook automatically detects when the S Pen has been pulled out and springs into action, instantly launching the Air Command menu that houses convenient shortcuts for a wide array of S Pen features. These features, which will be familiar to users of Samsung’s Galaxy Note smartphones, include Smart Select, which lets you conveniently crop and capture a desired portion of your screen, and Screen Write, which allows you to easily mark up screen-captured images. And because the S Pen is – as always – battery-free, it’s always ready to help you express yourself and be productive. Speaking of which, the Notebook 9 Pen also features several built-in tools, including versatile apps like Autodesk SketchBook and the Samsung Notes app, designed to help users express themselves and work more effectively. These apps add comfort and convenience to everything from doodling to writing, sketching, painting and more, and make each task that much more enjoyable. The Notebook 9 Pen’s Voice Note function offers users an innovative way to record their – and others’ – brilliant ideas. The software allows you to record crystal clear audio via the Notebook 9 Pen’s ‘far-field’ microphone, which utilizes advanced hardware, algorithms and noise suppression technology to isolate and record sounds even from distant sources. The function makes it easy to locate specific points in a recorded audio file – so finding a key highlight won’t require you to listen to the recording all over again – while also allowing you to mark and take notes within the file itself. Another Notebook 9 Pen feature designed to help students and professionals work and study more efficiently is teamPL, a software solution that allows you to easily share what’s displayed on your screen with up to five friends or colleagues connected to the same network. Utilizing this feature will allow you to instantly show others what you’re working on or looking at, and help your team collaborate more effectively. The Notebook 9 Pen also boasts support for a variety of Samsung apps designed to streamline how users share files, capture memories, and communicate. 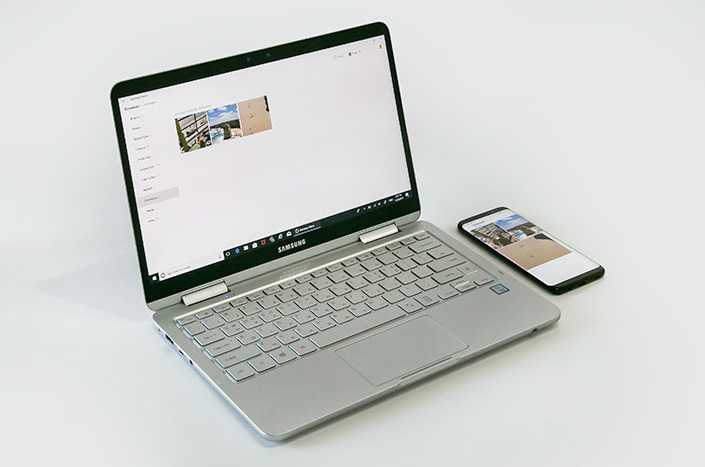 Support for the Samsung Link Sharing app makes it simple for users to share files stored on their PC – including photos, videos and documents – with their family, friends and colleagues. Transfers may be facilitated to virtually anyone with another PC or a smart device. The device’s Samsung Gallery integration, meanwhile, offers simple tools to streamline how users manage their most precious files: their photos and videos. Each time you use your phone*** to capture a memorable moment, Samsung Gallery will automatically sync the photo or video via Samsung Cloud so that it appears in the Notebook 9 Pen’s version of the app. This provides you with more freedom – and space – to manage and share your content. Finally, the notebook’s Samsung Messages app allows you to instantly reply to incoming texts and message any of your contacts without ever reaching for your phone. You can even use the app to drag and drop large files (up to 1GB) saved on the Notebook 9 Pen to share them with contacts saved on your phone. 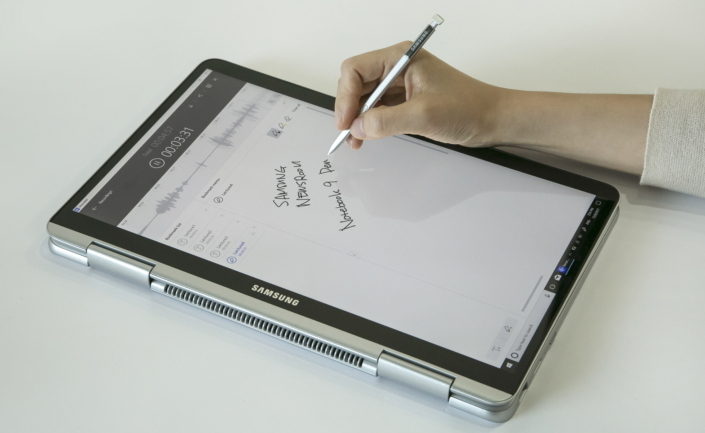 Along with packing a slew of seriously fun features, the Notebook 9 Pen comes preinstalled with Samsung Security, a seriously stout security solution designed to enhance users’ privacy and safeguard sensitive data. 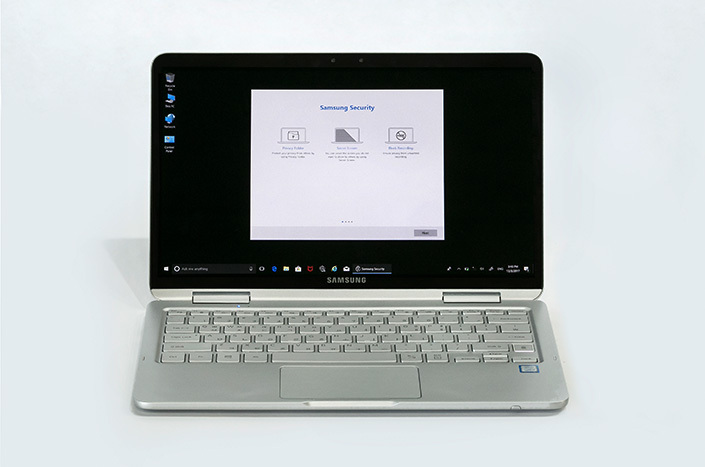 The software’s Privacy Folder feature allows users to add an extra layer of protection to sensitive files; the Secret Screen function obscures the notebook’s screen so that it’s visible only to the user; and Block Recording ensures that your webcam is protected from unauthorized access and recording. The Notebook 9 Pen’s Windows Hello support adds enterprise-grade biometric security to logins to streamline how users access their device and protect their data. The IR front-facing camera’s facial-recognition technology allows you to unlock your notebook with a glance, while the built-in fingerprint sensor lets you securely log in to your device, websites, and other services with a simple swipe – no password typing required. The Notebook 9 Pen is currently available to preorder in Korea, and will launch in select markets in the first quarter of 2018. * Requires either an AFC type Samsung battery pack, or a QX2.0 (Qualcomm) type battery. ** Size limit for each file is 1GB, and up to 2GB of content may be shared within a 48-hour span. *** Compatible with Samsung Galaxy smartphones running Android 7.0 and above, as well as select devices running Android 6.0, including the Galaxy Note4, Note5, S6 edge, S7 and S7 edge. **** Compatible with Samsung Galaxy smartphones running Android 7.0 and above, as well as select devices running Android 6.0, including the Galaxy Note5, S6, S6 edge, S6 edge+, S7 and S7 edge. Availability may vary by region. This feature utilizes SMS, and carriers may charge for usage depending on the user’s data plan.